Jio Prime has caused a whirlwind in the Indian telecom industry, and major telecom operators are come up with new and updated plans with unlimited data. Indian Global telecommunications services company Airtel has announced a new plan offering 1GB 4G data per day and unlimited voice calls to any operator at just Rs 349 per month. Out of 1GB daily data cap, the user can use only 500MB during the day, and the rest 500MB is available to consume between 3 and 5 am at night. On the next side of the coin, Jio launches the Prime subscription, which aims to retain its 100 million users base after its services end on 31st March, with a fair usage of 1GB/day by shelling out Rs 303/month. 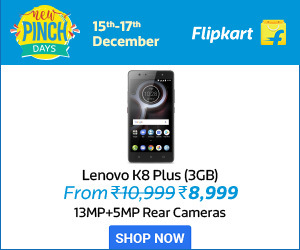 And there is also a Rs 499/month plan that offers 2GB of 4G data a day. 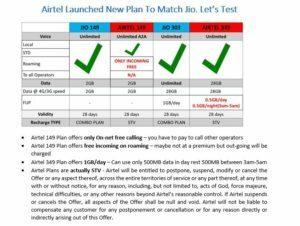 This latest Airtel plan is available to the entirety of its customer base, whereas Jio Prepaid and Jio Postpaid plans are only for prime customers. Earlier, Airtel has also launched a Rs 149 plan with unlimited Airtel to Airtel calls along with 2GB of 4G data for Rs149, and this plan is valid for 28 days. Bharti Airtel used to offer only 1GB of 4G data together with unlimited local/STD calls to all operators for Rs 345/month. Vodafone India is also come up with its new plan to counter Jio Prime; it offers 1GB 3G/4G data daily with unlimited free calls for just Rs 346. Idea Cellular has also announced a plan of Rs 345/month which offers 14GB of 4G data (500MB/day) along with unlimited calls.